With only a week to go the excitement is building! 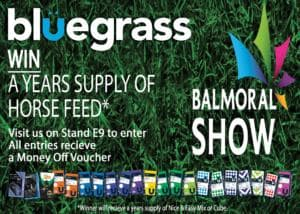 The Team at Bluegrass are in full swing organising our stand as well as prizes for The Bluegrass Team Schools Show Jumping Final to be held on Saturday. All you have you have to do is visit us on Stand E9 to fill in an entry form. We'll even throw in a money off voucher to everyone who enters!